Depending upon the sensor in your kit, the fluorescence can either increase or decrease in response to receptor activation. For example, #D0300G DAG Assay decreases in fluorescence when DAG levels increase in the cell. One can imagine applications where a downward sensor might have advantages over an upward sensor, for example, if background fluorescence is high. Both Upward and Downward DAG are bright, robust, and easy to detect on fluorescence plate readers. No need to fix or lyse your cells. 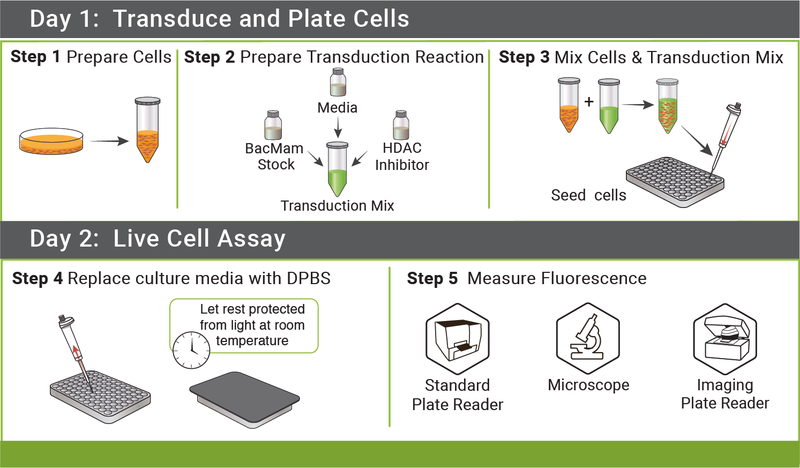 When monitoring the green fluorescence emitted by the sensor, a change in fluorescence intensity will be observed after addition of compounds that increase levels of DAG in the cell. This sensor is constructed with the very bright, mNeon green fluorescent protein . While the optimal excitation and emission wavelengths are 506 nm and 517 nm, respectively, a range of 485-505 nm for excitation and 515-535 nm for emission may be used. We recommend Chroma’s Catalog set #49003 for optimal results. Preferred excitation and emission wavelengths for mNeon Green are 488/525. Figure 2. HEK293T cells transduced with Green Downward DAG sensor and M1 Receptor, responding to the addition of 50μM Carbachol. Mean ± stdev, n = 20 cells. If the cells are expressing the sensor, and fluorescence is detectable on your instrument, then check the sensor using the positive control included in this kit. Adding 5 μL of the M1 muscarinic receptor virus to a set of control wells will ensure that a Gq-coupled receptor is present in your cells. You can double check to make sure the receptor is expressed by examining the cells in a fluorescent microscope with filters for red fluorescence. You should see the green sensor fluorescence throughout the cell, and red nuclear fluorescence that marks the cells that also express the M1 muscarinic receptor. 2. Dulbecco R, Vogt M: Plaque formation and isolation of pure lines with poliomyelitis viruses. The Journal of experimental medicine 1954. 5. Tewson PH, Martinka S, Shaner N, Hughes TE, Quinn AM: New DAG and cAMP sensors optimized for live cell assays in automated laboratories. Journal of Biomolecular Screening 2015. 6. Shaner, N.C., Lambert, G.G., Chammas, A., Ni, Y., Cranfill, P.J., Baird, M.A., Sell, B.R., Allen, J.R., Day, R.N., Israelsson, M., Davidson, M.W., & Wang, J. (2013) “A bright monomeric green fluorescent protein derived from Branchiostoma lanceolatum.” Nature Methods, May; 10(5):407-9. 7. U.S. Patent No. 9,547,017. Genetically-encoded fluorescent sensors for detecting intracellular signaling through diacylglycerol pathways.